Regular readers of this blog may remember that last February I posted a piece about the financial statuses of the four main archaeological consultancies in Northern Ireland, based on their Annual Returns to Companies House in Belfast. At that time the 2013 returns for only one company had been posted. In the intervening period, the 2013 accounts summaries for two further companies have been added, so I felt that it was an appropriate moment to reexamine the current state of commercial archaeology in Northern Ireland. As before, I will go through the companies from the oldest (by date of incorporation) to the youngest, followed by an averaged summation of the state of the industry. The first company on the list was incorporated in 1990. At the time of the last post, accounts were only available up until 2011. At that time Current Liabilities were reported at £590,987, against Current Assets of £553,797, and a Net Worth of -£37,190. However, additional breakdowns of these figures are publicly available at Open Company, allowing a greater level of granularity in terms of the Current Assets. Here we can see that only £27,300 are described as Tangible Assets, with the vast majority being the distinctly more dangerous asset of monies owed by Debtors: £526,497 - a whopping 95.07% of the company assets. The second oldest company, incorporated in 1997, now has key financials available up until 2013. At the time of my last examination of the company they had three directors, though they appear to have shed one and gained one, with a new company director being appointed on June 1st 2014. Overall, it has been a poor year for this outfit. While company assets now stand at £99,059, an increase of £18,183 on the previous year, the rest of the key financials aren’t looking so encouraging. Cash at bank is down to £325, a fall of £8410, or 96.28% - the lowest it has been since 2011. While cash flow can be relatively volatile, it is the Net Worth and Current Liabilities that are most worrisome. Liabilities now stand at £76,771 a rise of £42,320, or a 122.84% increase. Worst of all is the estimated Net Worth – in 2012 this was estimated at £14,221, up from an all-time low the previous year of -£23,735. However, in 2013 this slipped back into the red to -£6,443, a fall of 145.31%. Again, using the Open Company data, we can see that the Current Assets are actually composed of £2,862 of Tangible Assets, £23,987 of Stocks, and the £325 in cash. However, the largest proportion of the company assets - 73.34% - are in the form of outstanding debts owed to the company: £74,747. The next company on the list was founded in 2002 and retain the same two shareholders as before. In much the same way as the previous company, 2013 was a remarkably tough year. Cash at Bank is recorded as being down to £2,382, a fall of £7,744 (or 76.48%) from the previous year, and the second lowest amount for which records are available. It is certainly a startling fall from the all-time high of £50,812 recorded in 2009. Current Liabilities remain relatively steady at £105,036, a modest decrease of £8,172 (or 7.22%) from the previous year. 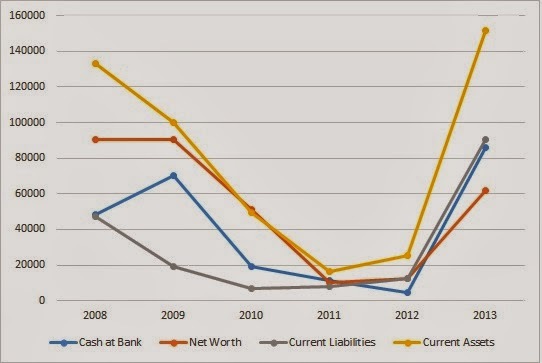 Here the most worrying issues centre on the Net Worth and Current Assets. The Current Assets are assessed at £27,269 in 2013. This is down £77,159 (or 73.89%) from £104,428 the previous year. As may be clearly seen from the graph, this is part of a much longer downward trend from a high of £376,007 in 2008 (the earliest date that records are available) – and overall fall of 92.75%. 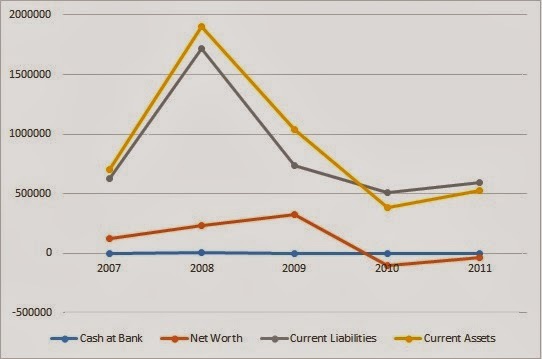 However, the most concerning figure here is the Net Worth. It parallels the broadly downward historical trend of the Current Assets and for 2013 is estimated at -£70,144. This is a significant decline from even the modest positive Net Worth of £1,759 recorded the previous year, and especially the all-time high of £258,932 for 2008. In this instance, the Open Company data is only relevant to the previous year, 2012. Nonetheless, it is worth noting that it here too the vast majority (82.02%) of the company's Current Assets are in the form of Debtors: £94,302. The remainder was made up of £10,540 in Tangible Assets, and £10,126 in cash. The final company, founded in 2005, recorded their best year in 2013. At that time their return could be broken down into having £85,858 as Cash in Bank; Current Assets of £151,755; and Current Liabilities of £90,585. Taken together, this amounted to a company Net Worth of £61,611. As they have already been discussed in the previous post, I don't intend to dwell on these figures other than to note that the Open Company data gives a slightly adjusted figure of £152,196 for the Current Assets (difference: £441). This is broken down into Tangible Assets to the value of £441, the £85,858 in cash previously mentioned, and £65,897 of outstanding debt owed to the company by Debtors. In this instance, the value of the Debtors contributes a significantly smaller percentage (43.30%) of the overall company assets than in the previous examples, though this is not an insignificant amount to be owed! Of course, the real point of this exercise is not merely to probe into the finances of these companies – as fun as that is. Private archaeological companies are in an unusual position in that the nature of their work entails the care and curation of an important corpus of culturally significant material. All the artefacts, samples, and ecofacts, along with the physical and digital archives of drawings, context sheets, etc. are of importance beyond their physical presence in these organisations. The material they hold has significant heritage value and belongs to the whole of society. Simply put, if one or more of these companies is forced out of business, there is a high degree of likelihood that this material will be lost. As I put it last time: ‘I could easily foresee the vast majority of archives – physical and digital – heading for the skip’. Such potential losses would rob us all. We know from correspondence with John O’Keeffe, Assistant Director/Principal Inspector of Historic Monuments at NIEA, Built Heritage, that while the possibility of such an event is on their agenda and they are formulating plans to deal with it, nothing is physically in place at this time [For an alternative view as to what can be achieved on a limited budget in the Republic of Ireland see: here]. The sad reality is that eight months on from my initial assessment nothing has changed – the NIEA still don’t have a plan in place to save our shared cultural assets should an archaeological company fail. And yet, some of these companies are still in financial peril. Leaving aside the very profitable 2013 for the 2005 company, one consultancy has recorded their worst performance on record (the 2002 company), resulting in a New Worth of -£70,144. The situation at the third company for which figures are available (1997 company) shows that while 2013 was not their worst year on record (that would be 2010 or 2011, depending on your criteria) it did see a drop in profitability from the modest increases of 2012. Not that anyone is paying attention to my suggestions, but I say let these companies fail. If they go under before the NIEA gets a safety net in place to rescue archives we will lose much data and large swathes of our physical heritage, but we know that there was never much chance of this material seeing the light of day as formal publications anyway ... but is that what we really want? I’ve said often enough that the most obvious potential solution to this issue is already in place – the Centre for Archaeological Research at QUB (just so we’re clear: I’m not affiliated with them in any way!). Their staff contain a large number of well-respected archaeologists with many years of commercial field experience, but their setting within the University sector has already paid dividends in terms of their significant output of publications – from peer-reviewed articles in academic journals to popular pieces for non-specialist consumption (see: here). They are, in my opinion, in a perfect position to take over from the failing archaeology-for-profit model and enter the commercial market to the benefit of all. Whether they would wish to take on such a role is another matter entirely (see: here)! So … what can we do in the meantime? I honestly don’t know … even with safeguards in place to secure individual company archives, there seems to be little motivation to address the broader question of the flawed archaeology-for-profit model. If one poorly-performing company goes to the wall there is nothing to stop an equally ephemeral organisation from taking its place … at least for a little while. In the meantime we can only wait for the 2014 figures and see if genuine recovery materialises or the slow circling of the plughole continues. In the original post I did not directly link any set of accounts to an individual company, referring to them only by their year of incorporation. However, based on the legal advice given to me, to allow for full clarity and fact-checking, I was advised to provide some degree of linkage between the two. To this end, I created a separate appendix where interested readers could investigate the figures I used and relate these back to identified companies. I maintain this arrangement for this post. The title for this post: ‘Trouble ahead, Trouble behind’ is taken from the Grateful Dead song ‘Casey Jones’ [Video | Lyrics | Wiki] from the 1970 album Workingman’s Dead. The song was first performed in concert on June 22nd 1969 at Central Park, New York. The entire concert is free to download & stream: here. But, of course, you knew that! This year's UCD School of Archaeology Research Seminar will include a range of presentations from staff, researchers and PhD students, showcasing ongoing and new research being carried out at University College Dublin. Topics will include reconstructing health patterns in the early medieval Irish community; Palaeolithic occupation and ancient genomics of early modern humans; Reconstructing living conditions in early medieval Ireland; UCD School of Archaeology’s contributions to Southeast Asian prehistory; Loughmoe Castle and the end of the middle ages; Early medieval Ireland in northwest Europe; and lots more! I suppose, like most people, I get sent so many of these invitations that it’s impossible to be enthusiastic about them all, let alone have the time, finances, and energy to attend. This one just seemed a little different and something must have clicked in my head as I decided that I was definitely going to be there. I’ll spare you all the details of my preparation … save one. I don’t know the University College Dublin campus at Belfield at all … I think I’ve been there twice in the last two decades … and one of those was in the company of my brother … when a number of pints were had … so it doesn’t really count! To counteract my lack of knowledge, I resolved to find and print out a small collection of maps to bring me safely from Dublin City Centre out to Belfield. In applying the power of Google to my problem, I discovered that there was a free map of the UCD campus to be found on Apple’s App Store. In my haste to embrace technology, I neglected to notice that it was a different UCD … University of California, Davis! I did rather wonder when my map was showing me Interstate 80, rather than where the 39a bus stopped. Thankfully, the campus is not as bewilderingly huge as I had feared and a couple of polite enquiries saw me on my way. First to the speaker’s podium was Prof Ron Pinhasi, who welcomed all the attendees. He promised that we would witness an interesting combination of papers that adequately reflected the diversity of the research undertaken at UCD. He also underlined the interconnectedness of that research in investigating common questions through shared techniques, including the use of DNA and advanced techniques of genetic sequencing, etc. The first session was to concentrate on Morphological variation, genetics, health and diet and it began with Dr Mario Novak (IRC Fellowship) to talk about Reconstructing health patterns in the early medieval Irish community: osteoarchaeological study of the Omey Island skeletal collection. This presentation is but a small part of his current research project: Analyses of the quality of life in Europe during the Early Middle Ages (AD 500-1100) - Comparisons between human skeletal series from Ireland and Croatia based on bioarchaeological, ancient DNA, and stable isotope data. Within both the Omey Island data and the wider project, the focus is on the archaeological, social, ecological contexts of the populations, and investigated through the use of DNA and stable isotope studies. The Irish portion of this project includes four excavated populations from Augherskea, Co. Meath, Collierstown, Co. Meath, Gracedieu, Co. Dublin, and Omey Island. 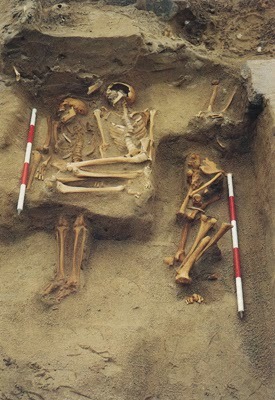 Of these, the Omey island group is, by far, the largest, with c.500 burials. Omey lies of the coast of Connemara, Co. Galway and was excavated in 1990, 1992, and 1993 by Prof. Tadhg O’Keeffe. The excavations at the monastic site (traditionally associated with St. Féchín of Fore) revealed evidence for five major phases of occupation, from the Early Bronze Age to the 18th century. Between the Early and Late Medieval graveyards, the remains of some 300 individuals were investigated. Of the 160 individuals so far examined by Novak, 43 are sub-adults, 43 are male, 49 are female, and 25 could not be definitively sexed. In the latter case, this was usually due to the fact that only partial remains survived. Although Novak urges caution about the robustness of the means for aging skeletons, he suggests that the average age at death for adults was 45 years for men and 41 years for women. The youngest set of remains may be aged to 42 lunar weeks old and was probably a neonatal still-born child. Most adults died in the period from 36 to 50 years, though there was a very high sub adult (0-5 years) mortality rate of 25%. In terms of dental health, Novak calculates that there was an average rate of caries decay per tooth of 4.5%. The figure was 27.3% in the adult skeletons, though this it was higher in males over females. Ante mortem tooth loss ran at 15%, though this was again higher in males. To illustrate the point, he showed an image of a mandible from an older male who had lost all of his teeth on the right side and noted that tooth loss was positively correlated with age – the older you got, the more likely you were to lose teeth. Evidence for cribra orbitalia was found on 37.8% of the population (39 of 103 individuals). It was only found to be active at the time of death in two cases, indicating that most individuals recovered and survived. Linear enamel hypoplasia was noted on some 40% of teeth, and on 65% of individuals. Again, incidence was higher in males over females. This condition is commonly associated with weaning and forms around the ages of 2 to 4. Indeed, some 40% of the Omey children suffered severe stress in childhood. Evidence of infectious diseases included such non-specific infectious diseases as periostitis. Two active cases of periostitis were identified (one on a new born (<2 years), along with two cases where it had healed, one on a child of 6-7 years and another on one of 11-13. Evidence of tuberculosis was found on one skeleton, a female who died between 28 and 35 years. She exhibited lytic lesions on several vertebrae that led to severe kyphotic deformity. Some 20 individuals exhibited evidence of some form of skeletal trauma. These included 10 males, nine females, and one sub adult. Injuries were confined to long bones, crania, vertebrae, and foot bones, suggesting that most of these were the result of accidents, not intentional violence. Novak’s preliminary conclusions are that the demographic evidence suggests that this is not a typical monastic cemetery, considering the presence of both women and children. The relatively low frequency of dental caries suggests that the diet was partially based on protein, an observation supported by the large numbers of animal bones bearing butchery marks recovered from the excavation. The higher incidence of linear enamel hypoplasia in males is interesting and Novak suggests that it may represent different weaning strategies between the sexes. For the most part, this was a peaceful place and relatively similar to other early medieval sites. Novak hopes that future work on the Omey Island population (and his larger project generally) will include a raft of radiocarbon dates and the use of Ancient DNA (aDNA). It is hoped that the latter will allow new methods of molecular sexing of skeletons, and the identification of ancient pathologies. Then it was Prof. Ron Pinhasi making a return to the podium to talk about his own work on The palaeolithic occupation and ancient genomics of early modern humans from Western Georgia. This area of the north and south Caucasus – between the Black and Caspian seas – has long been seen as an area of interface between Neanderthals and early modern humans. His current project seeks to refine the chronology of these Neanderthal and early modern humans through getting dates from previously excavated material. One of the developments in recent years has been that Neanderthals are a Eurasian-wide species, not just a European one. Working with a range of collaborators, Pinhasi has secured new dates from modified animal bone from Mezmaiskaya and from Nenaderthal bones. Although an initial examination of the results appears to indicate that the lower material is younger than that above it, the dates have been clarified through Bayesian modeling and show that Neanderthals went extinct in this region around 39k BP. 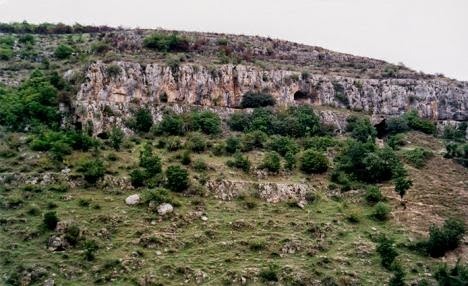 Evidence from Ortuala and Sakazhia indicate that Neanderthals did not survive past 37k BP. There had been a possibility of an overlap between Neanderthals and early modern humans, but the evidence now suggests that humans only came to the area about 4ky after the demise of the Neanderthal population. A reassessment of the sites where evidence of the two species appear to have been found together leads to the conclusion that these are mixed deposits, and do not reflect actual experience. At Satsurblia the team have carried out new excavations, uncovering living surfaces and hearths dating to approximately 15k BP. At the back of the cave they have evidence of occupation going back to 20k BP and have recovered an epi-Gravettian tool, the first one identified from the region. Other work has involved the study of aDNA from two human remains, dating to 13k BP. The results have been plotted against the DNA signatures of the modern populations of the area. Preliminary results indicate that they fall between the Caucasus’ and nearby populations, indicating a remarkable longevity in human settlement in the area. Abigail Ash (ERC funded PhD) spoke on Farming and Forging: Living with stress in Neolithic and metal age Central Europe. Ash noted that studies of health in prehistoric populations have tended to focus on the transition from hunting and gathering to largely agricultural subsistence with the adoption of the Neolithic lifestyle in Europe. She argues that there is a growing awareness of diversity between Neolithic communities and, in consequence, there is a need for deeper investigation into the effects of later agricultural intensification on the health of populations, along with those posed by later development of copper, bronze and iron industries. Her research focuses on samples from thirteen Central European populations dating from the Early Neolithic to the Iron Age (from 8k BP to 2k BP), looking for indicators of the health of the populations. She notes that it is difficult to ask the excavated skeletons questions about ‘how they are feeling’ and that ideas of population health can only come through osteoarchaeology. Even still, she was quick to point out that this is an incomplete record, as many diseases do not manifest on the skeleton. Nonetheless, her work on those skeletons has identified evidence for a number of diseases, including cribra orbitalia, porotic hyperostosis, and joint degradation. In a beautiful turn of phrase, Ash sees health as being ‘at the centre of a dynamic equilibrium’ between time and genetics. The underlying expectations are that behavioural change over time is associated with changes in population health. Other expectations include the expectation that evidence of social stratification can be observed in the skeletal record and that social stressors leads to reductions in individual longevity. Initial results from her study populations from Germany, the Czech Republic, Slovakia, Hungary etc. from the Neolithic to the Iron Age show no evidence for a decline of health over time. For example, the levels of joint degradation show no significant changes between periods. 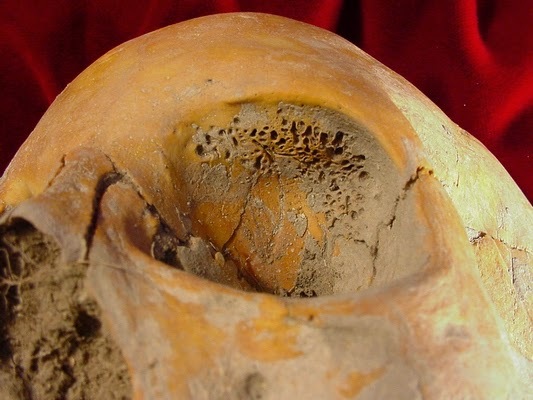 Other results include the observation that cribra orbitalia and porotic hyperostosis can be observed at relatively high levels in the Neolithic, falling significantly during the Bronze Age, but with a defined spike in the Iron Age. She argues that these and similar results may be correlated with population movements across the region over time. With the time rapidly approaching midday, the assembled group took time for a brief coffee break … and I think I’ll leave it there too for this post. I appear to have developed a taste for old fashioned 3D (anaglyph) images and have been experimenting with various approaches and software packages. To be able to enjoy these for yourself, all you need is a pair of red/blue (cyan) classes. It is reasonably cheap to purchase a basic set of glasses (or even a deluxe set), or simply make your own. I am delighted to introduce the first entrant to the The 2014 Bob Chapple Archaeological Essay Prize in association with Wordwell Books. Stephen Domican's paper Archaeogenetics: future potential and challenges describes his current research and will shortly be appearing in Trowel magazine (Domican, S. (2014) 'Archaeogenetics: future potential and challenges', Trowel, 15, pp. TBC.). If you would like to enter, please check out the criteria at the end of the post: here. Recent developments in the field of genetics, especially next generation sequencing technologies, has set the stage for archaeogenetic research - that is the study of the ancient past using genetic data (Renfrew, 2001) - to become as revolutionary a methodology in archaeological research as the development of radiocarbon dating was in the 1950’s (Taylor, 1995). In 2003, the human genome project successfully completed its 13 year project to completely sequence the human genome, at a cost of nearly $3 billion dollars (Lunshof et al., 2010). 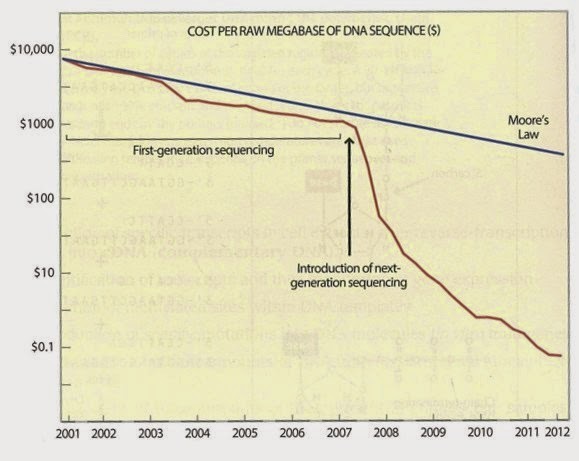 The development of next generation sequencing in 2005 (Knapp and Hofreiter, 2010; Schuster, 2007) brought rapid price decreases, and now the recent release of Illumina's HiSeq X Ten platform claims to allow researchers to sequence the human genome in just three days, at a cost of around $1000 (Sheridan, 2014). With the cost of sequencing an entire genome further predicted to drop down to the $100 mark in the near future (Stein, 2013), archaeological research is set to be radically impacted in the coming decades by the amazing potential of archaeogenetics. In this paper some of the history and potential applications of genetic research in archaeology, along with some of the challenges of effectively interpreting genetic data, will be examined to show how this emergent technology is poised to become a mainstream tool for archaeological research in the not too distant future. If the 20th century can be seen as the age of the computer, then the 21st is setting itself up as the age of the biologist (Losos et al., 2013). For the past decade a stirring revolution in genetics has seen the constant strive for faster, more efficient and cheaper technology, that is predicted to make genetic technology as important and mainstream a technology as computers have now become (Losos et al., 2013). For years ancient genetic research has been hampered by issues, both technical and cost related, limiting its scope to the select analysis of small sections of the genetic code of samples, such as the mitochondrial DNA (Gilbert et al., 2005; Knapp and Hofreiter, 2010). Now, a series of new genetic sequencing methods collectively known as “next generation sequencing” technologies (Knapp and Hofreiter, 2010; Mardis, 2008; Metzker, 2009), along with new techniques developed to identify ancient DNA from modern DNA contamination (Ginolhac et al., 2011; Skoglund et al., 2014) has ushered in the beginning of a new age of archaeogenetic research: one where highly accurate genetic data can be obtained at a fraction of the cost, and at a scale that was unthinkable only a few years ago (see figure 1). This paper aims to show the importance of ancient DNA research as an archaeological subfield, and will discuss some of the different ways archaeogenetic research can be used by archaeologists to learn about the past. This paper will also discuss some of the challenges that come with interpreting this data, along with touching upon some of the history of ancient DNA research, both how it got to the stage it is currently at, as well as discussing some of the exciting ways new lower cost genetic technology could be applied to archaeological research in the coming years. The field of genetic research has seen drastic changes since James Watson and Francis Crick first discovered the double helix structure of DNA in 1953 (Watson and Crick, 1953). Thirty years after their pioneering breakthrough, the field of ancient DNA was born in the mid 1980’s, with the extraction and sequencing of DNA from the quagga, an extinct South African equid, along with the extraction of DNA from an Egyptian mummy sample (Pääbo, 1985; Higuchi et al., 1984). Earlier attempts at DNA extraction were unfortunately often foiled by the lack of appropriate technology to allow scientists to distinguish between endogenous ancient DNA (known as aDNA) and outside sources of DNA contamination (Skoglund et al., 2014). One of the key developments in genetic studies, the development of PCR (polymerase chain reaction) technology, has allowed geneticists to amplify genetic material for analysis (Jobling and Hurles, 2012, p.95-129). While revolutionary for the field of genetics, PCR did have serious problems for the study of ancient DNA, replicating not only the surviving ancient DNA, but also any contaminating DNA from other exogenous sources present in the sample (Ginolhac et al., 2011). For this reason, many earlier reports of DNA extraction from ancient specimens, and all reports from specimens over a million years old – including all reports of dinosaur DNA (Pääbo et al., 2004) – have been widely dismissed as being the amplified DNA of modern contaminants (Rizzi et al., 2012). The issue of contamination has remained a major issue, with Cooper and Poinar (2000), in their now seminal paper: “Ancient DNA: Do it right or not at all”, openly criticising the lack of contamination control from many practitioners in the field. Simultaneously they suggested a list of standards to be followed, such as having an isolated work area and an outside lab replicate results, which have laid much of the groundwork for modern aDNA standards (Gilbert et al., 2005). These aforementioned contamination issues, as well as high costs, both financial and the time associated with performing the sequencing, have been a limiting factor in the wide-spread application of genetic research to the field of archaeology until now. Genetic research is a powerful tool for the archaeologist, and it can be used to look at large, macro-scale questions asked of the past, such as how populations have migrated and reproduced over time (Knapp et al., 2012; Pinhasi et al., 2012; Ralph and Coop, 2013; Veeramah and Hammer, 2014). This is important not only for the information it can potentially tell us about past population movements, but also because it allows us to answer questions relating to the long standing debate of cultural vs demic diffusion (Pinhasi et al., 2012), and whether specific technological and cultural changes primarily occurred due to contact with external cultural groups (cultural diffusion), or if the spread of ideas is down to the migration of people into a new area (demic diffusion). Genetic research can also be used to analyse archaeological remains at the level of the individual. Past research has shown how the analyses of a wide variety of attributes such as kinship (Deguilloux et al., 2014), diet (Bon et al., 2012; Hofreiter et al., 2001, p.358), individual ethnic descent (Martiniano et al., 2014), health (Leonardi et al., 2012), and even personal information such as hair and eye colour (Lalueza-Fox et al., 2007; Olalde et al., 2014) are now within our technological capability. Of great potential is how genetic research now allows us to look at one of the most essential social units of all: that of kinship. By observing changes in inheritable DNA such as mitochondrial (mtDNA) and Y DNA (non-recombining portion of the Y chromosome: NRY) - passed down from mother and father respectively (Jobling and Hurles, 2012) - as well as by observing changes to other components of the genetic code that are passed from generation to generation (Jobling and Hurles, 2012), archaeologists are now able to research familial relations in a whole new way, through the observation of kinship patterns in the archaeological record. Both modern and ancient DNA can be used to analyse past population descent and migration. By observing the aforementioned changes in the genetic code, that are inherited, researchers have been able to analyse large scale population migrations, and develop theories as to how migrants interbred with local populations. Most notably this was used to investigate the “out of Africa” theory of how anatomically modern humans originated and migrated from Africa (Veeramah and Hammer, 2014). This model was later expanded upon, with additional analyses suggesting a level of genetic breeding between non-African humans and other species of hominin such as Neanderthals and Denisovans (Huerta-Sánchez et al., 2014; Sankararaman et al., 2014). Much research in the past decades has focused on the origins and migration of prehistoric populations (Brandt et al., 2013; Pinhasi et al., 2012; Raghavan et al., 2013; Ralph and Coop, 2013; Skoglund et al., 2012), and a particular “hot topic” of examination has been whether the spread of agricultural and other technologies associated with the Neolithic – the so called “Neolithic package” – better fits into the aforementioned cultural or demic model of diffusion. Related work has focused on both analysing the genetic spread of ancient human populations (Pickrell and Reich, 2014) and the genetic signature of the domesticated animals that accompanied them (Cai et al., 2014; Larson et al., 2007), in order to test and develop new migration theories. Indeed, as genetic sequencing costs decrease, large scale population studies will become an increasingly lucrative area of research and it will be exciting to see what future results will uncover. Genetic research also allows archaeologists to examine ancient trade and exchange networks, and to deconstruct how organic materials were exchanged. Publication of genetic data obtained from swabs sampled from ancient Greek amphorae, recovered from 5th-3rd century BCE shipwrecks (Foley et al., 2012), serves as a prime example of how previously inaccessible data can be obtained from organic remains hidden within artefacts. This study was able to identify not only the contents of most of the amphorae, which were found to contain a mixture of herbs and olive oil, but was also able to challenge long held assumptions that amphorae were primarily used in the transportation of wine (Foley et al., 2012). The genetic research from this paper was also able to identify new data as to what ancient diet was like, opening up the exciting potential of research into how ancient dietary tastes have co-evolved with trading activity over time. Indeed, another paper highlighting the use of archaeogentic research in the analyses of ancient trade, published by Arndt et al (2003), looked into ancient smoked catfish (clarias) remains from the Roman/Early Byzantine town of Sagalassos, in Turkey. Using analysis of variations in the mitochondrial DNA, which is inherited only from the female parent (Jobling and Hurles, 2012), the authors were able to identify not only the species of catfish exchanged, but also provenance a probable upper Nile river source for these remains. Although both studies were limited by their use of older – that is, non “next-generation” – sequencing technologies, these publications highlight how archaeogenetic research can be effectively used to research ancient trade of organic materials. Due to the networked nature of exchange, this type of research becomes exponentially more useful once larger data sets are obtained from multiple geographic locations, something which has been previously limited due to prior mentioned cost and technology issues. With increasing attempts to extract ancient DNA from a wide variety of organic and non-organic materials and remains (King et al., 2009), and the aforementioned trend of decreasing costs and improved technologies suggesting that in the near-future we are likely to see this barrier become less of an obstacle for provenance studies in archaeological research. There is also much potential for genetic research to be applied to the identification of organic remains in archaeological artefacts, both through the identification of previously unknown organic material within artefacts, and through identifying minute genetic information in environmental samples. A number of recent studies have successfully managed to extract ancient DNA from organic materials, such as manuscripts (Poulakakis et al., 2007) and cereal grains (Fernández et al., 2013), in an attempt to identify the species and possible origin. Of particular note is the recovery of ancient DNA from organic material contained within non-organic material such as flint tools (Shanks et al., 2005; Shanks, Kornfeld and Ream, 2004) and ceramics (Foley et al., 2012). Due to the poor preservation of organic material over time, archaeologists are often faced with an incomplete picture as to how exactly ancient humans interacted with the organic material that comprised a large part of the world around them. By detecting even minute organic remains in artifacts and environmental samples, the field of archaeogenetics is increasingly allowing for more informed research to take place on this interaction between both human and material-culture and human and non-human species. Although genetic research has seen vast advances over time, there are still many challenges researchers face in order to correctly use this source of data (Gilbert et al., 2005). The challenge is no longer so much in how you extract the data, but in how such large amounts of biological data is computationally handled (Flicek and Birney, 2009; Li and Homer, 2010; Treangen and Salzberg, 2011), along with how researchers interpret this data, that is key to its effective application to archaeological questions. However, issues of contamination are still – and likely will always remain - a concern, and proper protocol to avoid contamination, both at the excavation and later DNA sequencing phase, is a key step to the production of reliable data. This includes provision of the provenance of the sample (Gilbert et al., 2005), the avoidance of excess handling of any archaeological artifacts or organic remains, and the wearing of sterile gloves during handling (Roberts and Ingham, 2008). Proper provenance of an archaeological specimen is particularly important, as older contamination from artifacts and remains excavated decades or centuries prior to examination may exhibit similar DNA damage patterns as endogenous ancient DNA. This older contamination can inhibit aDNA screening techniques that rely on analysing particular damage patterns in ancient DNA in order to correctly differentiate between endogenous ancient DNA and modern contamination (Jobling and Hurles, 2012). Appropriate ethical considerations also need to be taken when working with samples from living human beings, used in the research of past population migrations; prior controversy and legal action has occurred from improper usage of genetic data in research for which the donors did not give prior consent (Reardon and TallBear, 2012). Indeed, there is now a need for archaeologists to familiarise themselves with genetic research, in order to be able to critically assess which research is up to standard, so that archaeologists can make the decision as to when the destruction of irrecoverable archaeological material consumed in the DNA extraction process is validated. Of concern is the fact that serious criticism has been levelled at much prior ancient DNA research (Gilbert et al., 2005). For example, Roberts and Inham (2008) noted significant issues in the quality of paleopathology papers, studying ancient diseases, observing that out of 65 ancient DNA papers published between 1993 and 2006 that attempted to detect ancient pathogens, 45% of them failed to refer to whether an isolated ancient DNA laboratory had been used in the research, 90% did not discuss excavation procedures of samples, and only 12% of papers reported independent replication of their results as suggested by Cooper and Poinar (2000). Of note is the fact that not on reported paper managed to adhere completely to all listed contamination criteria. It is also important that archaeologists familiarise themselves with which material is viable for genetic extraction. Genetic degradation is a complex process, occurring due to a number of environmental factors such as temperature and humidity (Smith et al., 2003), and DNA is also believed to survive better in certain bones and remains than in others (Campos et al., 2012). Although samples sizes required for testing are often small, DNA extraction still involves costs, both in terms of the physical damage done to archaeological remains and the financial costs involved in sample extraction. For this reason, much research is currently being undertaken to develop heuristics for which samples should be used in DNA extraction. For example, by calculating the environmental conditions or “thermal age” (Smith et al., 2003) of a sample, researchers are now able to identify the samples which are still likely to contain genetic material, in order to avoid unnecessary waste. Informed archaeologists, aware of the uses and challenges of genetic research are needed now more than ever, both in order to make the correct decisions as to which samples, if any, are viable for DNA extraction, and that these samples are then used to answer specific archaeological research questions. In order to be able to properly utilise genetic research, archaeologists must develop a critical eye to the validity of any publications involving genetic research in an archaeological context (Gilbert et al., 2005), and whether they have sufficiently designed their research experiment to properly control for outside contamination hazards. In conclusion, further predictions of increasing technological capacity at a lower cost, along with better sampling methodologies, and novel new applications for archaeogenetic research in analysing non-organic material, is likely to soon make genetic research an increasingly integral component of archaeological research. We are entering an exciting age for archaeological research, as the full potential of genetic technology and large scale, low cost genetic sequencing is still to be fully uncovered. This paper is dedicated to the memory of my recently passed grandfather Séan Bradley, to whom I credit my love of the ancient past, and who encouraged me to write my first publication for the 2013 edition of this journal last year. I would also like to thank Dr Dan Bradley, and the researchers at the Molecular Population Genetics lab, Trinity College, Dublin, for inviting him to take part in a 5 week internship with them, which served as the inspiration for the article topic. Arndt, A., Van Neer, W., Hellemans, B., Robben, J., Volckaert, F. and Waelkens, M. (2003). Roman trade relationships at Sagalassos (Turkey) elucidated by ancient DNA of fish remains, Journal of Archaeological Science, 30(9), pp.1095-1105. Bon, C., Berthonaud, V., Maksud, F., Labadie, K., Poulain, J., Artiguenave, F., Wincker, P., Aury, J. and Elalouf, J. (2012). Coprolites as a source of information on the genome and diet of the cave hyena. Proceedings of the Royal Society B: Biological Sciences, 279, pp. 2825-2830. Brandt, G., Haak, W., Adler, C., Roth, C., Szécsényi-Nagy, A., Karimnia, S., Möller-Rieker, S., Meller, H., Ganslmeier, R., Friederich, S. and others, (2013), Ancient DNA reveals key stages in the formation of central European mitochondrial genetic diversity. Science, 342(6155), pp.257-261. Cai, D., Sun, Y., Tang, Z., Hu, S., Li, W., Zhao, X., Xiang, H. and Zhou, H. (2014). The origins of Chinese domestic cattle as revealed by ancient DNA analysis, Journal of Archaeological Science, 41, pp.423-434. Campos, P., Craig, O., Turner-Walker, G., Peacock, E., Willerslev, E. and Gilbert, M. (2012). DNA in ancient bone--Where is it located and how should we extract it?, Annals of Anatomy-Anatomischer Anzeiger, 194(1), pp.7-16. Cooper, A. and Poinar, H. (2000). Ancient DNA: do it right or not at all. Science, 289(5482), pp.1139-1139. Deguilloux, M., Pemonge, M., Mendisco, F., Thibon, D., Cartron, I. and Castex, D. (2014). Ancient DNA and kinship analysis of human remains deposited in Merovingian necropolis sarcophagi (Jau Dignac et Loirac, France, 7th--8th century AD). Journal of Archaeological Science, 41, pp.399-405. Fernández, E., Thaw, S., Brown, T., Arroyo-Pardo, E., Buxó, R., Serret, M. and Araus, J. (2013). DNA analysis in charred grains of naked wheat from several archaeological sites in Spain. Journal of Archaeological Science, 40(1), pp.659-670. Flicek, P. and Birney, E. (2009). Sense from sequence reads: methods for alignment and assembly. Nature methods, 6, pp.6-12. Foley, B., Hansson, M., Kourkoumelis, D. and Theodoulou, T. (2012). Aspects of ancient Greek trade re-evaluated with amphora DNA evidence. Journal of Archaeological Science, 39(2), pp.389-398. Gilbert, M., Bandelt, H., Hofreiter, M. and Barnes, I. (2005). Assessing ancient DNA studies. Trends in Ecology & Evolution, 20(10), pp.541-544. Ginolhac, A., Rasmussen, M., Gilbert, M., Willerslev, E. and Orlando, L. (2011). mapDamage: testing for damage patterns in ancient DNA sequences. Bioinformatics, 27(15), pp.2153-2155. Higuchi, R., Bowman, B., Freiberger, M., Ryder, O. and Wilson, A. (1984). DNA sequences from the quagga, an extinct member of the horse family. Nature. 312, pp. 282-284. Hofreiter, M., Serre, D., Poinar, H., Kuch, M. and Pääbo, S. (2001). Ancient DNA. Nature Reviews Genetics, 2(5), pp.353-359. Huerta-Sánchez, E., Jin, X., Bianba, Z., Peter, B., Vinckenbosch, N., Liang, Y., Yi, X., He, M., Somel, M., Ni, P. and others, (2014). Altitude adaptation in Tibetans caused by introgression of Denisovan-like DNA. Nature, 512(7513), pp.194-197. Jobling, M., Hurles, M. and Tyler-Smith, C. (2012). Human evolutionary genetics. 2nd ed. New York: Garland Science. Khairat, R., Ball, M., Chang, C., Bianucci, R., Nerlich, A., Trautmann, M., Ismail, S., Shanab, G., Karim, A., Gad, Y. and others, (2013). First insights into the metagenome of Egyptian mummies using next-generation sequencing. Journal of applied genetics, 54(3), pp.309-325. King, G., Gilbert, M., Willerslev, E., Collins, M. and Kenward, H. (2009). Recovery of DNA from archaeological insect remains: first results, problems and potential. Journal of Archaeological Science, 36(5), pp.1179-1183. Knapp, M. and Hofreiter, M. (2010). Next generation sequencing of ancient DNA: requirements, strategies and perspectives. Genes, 1(2), pp.227--243. Larson, G., Albarella, U., Dobney, K., Rowley-Conwy, P., Schibler, J., Tresset, A., Vigne, J., Edwards, C., Schlumbaum, A., Dinu, A. and others, (2007). Ancient DNA, pig domestication, and the spread of the Neolithic into Europe, Proceedings of the National Academy of Sciences, 104(39), pp.15276-15281. Lalueza-Fox, C., Römpler, H., Caramelli, D., Stäubert, C., Catalano, G., Hughes, D., Rohland, N., Pilli, E., Longo, L., Condemi, S. and others, (2007). A melanocortin 1 receptor allele suggests varying pigmentation among Neanderthals, Science, 318(5855), pp.1453-1455. Leonardi, M., Gerbault, P., Thomas, M. and Burger, J. (2012). The evolution of lactase persistence in Europe. 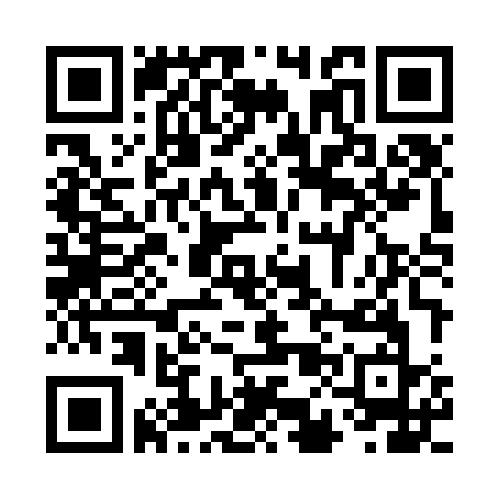 A synthesis of archaeological and genetic evidence. International Dairy Journal, 22(2), pp.88-97. Li, H. and Homer, N. (2010). A survey of sequence alignment algorithms for next-generation sequencing, Briefings in bioinformatics, 11(5), pp.473-483. Losos, J., Arnold, S., Bejerano, G., Brodie III, E., Hibbett, D., Hoekstra, H., Mindell, D., Monteiro, A., Moritz, C., Orr, H. and others, (2013). Evolutionary biology for the 21st century, PLoS biology, 11(1). Lunshof, J., Bobe, J., Aach, J., Angrist, M., Thakuria, J., Vorhaus, D., Hoehe, M. and Church, G. (2010). Personal genomes in progress: from the human genome project to the personal genome project, Dialogues in clinical neuroscience, 12(1), p.47. Mardis, E. (2008). Next-generation DNA sequencing methods. Annu. Rev. Genomics Hum. Genet., 9, pp.387-402. Martiniano, R., Coelho, C., Ferreira, M., Neves, M., Pinhasi, R. and Bradley, D. (2014). Genetic Evidence of African Slavery at the Beginning of the Trans-Atlantic Slave Trade, Scientific Reports, 4. Metzker, M. (2009). Sequencing technologies—the next generation. Nature Reviews Genetics, 11(1), pp.31-46. Olalde, I., Allentoft, M., Sánchez-Quinto, F., Santpere, G., Chiang, C., DeGiorgio, M., Prado-Martinez, J., Rodríguez, J., Rasmussen, S., Quilez, J. and others, (2014). Derived immune and ancestral pigmentation alleles in a 7,000-year-old Mesolithic European. Nature, 507(7491), pp.225-228. Pääbo, S., Poinar, H., Serre, D., Jaenicke-Després, V., Hebler, J., Rohland, N., Kuch, M., Krause, J., Vigilant, L. and Hofreiter, M. (2004). Genetic analyses from ancient DNA. Annu. Rev. Genet., 38, pp.645-679. Pääbo, S. (1985). Molecular cloning of ancient Egyptian mummy DNA, Nature, 314, pp.614-615. Pickrell, J. and Reich, D. (2014). Towards a new history and geography of human genes informed by ancient DNA. Trends in Genetics, 30(9), pp.377-389. Pinhasi, R., Thomas, M., Hofreiter, M., Currat, M. and Burger, J. (2012). The genetic history of Europeans. Trends in Genetics, 28(10), pp.496-505. Poulakakis, N., Tselikas, A., Bitsakis, I., Mylonas, M. and Lymberakis, P. (2007). Ancient DNA and the genetic signature of ancient Greek manuscripts. Journal of archaeological science, 34(5), pp.675-680. Roberts, C. and Ingham, S. (2008). Using ancient DNA analysis in palaeopathology: a critical analysis of published papers, with recommendations for future work. International Journal of Osteoarchaeology, 18(6), pp.600-613. Raghavan, M., Skoglund, P., Graf, K., Metspalu, M., Albrechtsen, A., Moltke, I., Rasmussen, S., Stafford Jr, T., Orlando, L., Metspalu, E. and others, (2013). Upper Palaeolithic Siberian genome reveals dual ancestry of Native Americans. Nature, 505, pp.87-91. Ralph, P. and Coop, G. (2013). The geography of recent genetic ancestry across Europe. PLoS biology, 11(5). Reardon, J. and TallBear, K. (2012). Your DNA is our history. Current Anthropology, 53(S5), pp.233-245. Renfrew, C. (2001). From molecular genetics to archaeogenetics. Proceedings of the National Academy of Sciences, 98(9), pp.4830--4832. Rizzi, E., Lari, M., Gigli, E., De Bellis, G. and Caramelli, D. (2012). Ancient DNA studies: new perspectives on old samples. Genet Sel Evol, 44. Sankararaman, S., Mallick, S., Dannemann, M., Prüfer, K., Kelso, J., Pääbo, S., Patterson, N. and Reich, D. (2014). The genomic landscape of Neanderthal ancestry in present-day humans. Nature, 507(7492), pp.354-357. Schuster, S. (2007). Next-generation sequencing transforms today’s biology. Nature methods, 5, pp.16-18. Sheridan, C. (2014). Illumina claims $1,000 genome win. Nature Biotechnology, 32(2), p.115. Skoglund, P., Northoff, B., Shunkov, M., Derevianko, A., Pääbo, S., Krause, J. and Jakobsson, M. (2014) Separating endogenous ancient DNA from modern-day contamination: application to a Siberian Neandertal, PNAS, 111(6), pp. 2229-2234. Skoglund, P., Malmström, H., Raghavan, M., Storåa, J., Hall, P., Willerslev, E., Gilbert, M., Götherström, A. and Jakobsson, M. (2012). Origins and genetic legacy of Neolithic farmers and hunter-gatherers in Europe. Science, 336(6080), pp.466-469. Smith, C., Chamberlain, A., Riley, M., Stringer, C. and Collins, M. (2003). The thermal history of human fossils and the likelihood of successful DNA amplification. Journal of Human Evolution, 45(3), pp.203-217. Stein, R. (2013). Genomic Data in Patients' Hands. Genetic Engineering & Biotechnology News, 33(4), pp.34-36. Shanks, O., Hodges, L., Tilley, L., Kornfeld, M., Lou Larson, M. and Ream, W. (2005). DNA from ancient stone tools and bones excavated at Bugas-Holding, Wyoming. Journal of Archaeological Science, 32(1), pp.27-38. Shanks, O., Kornfeld, M. and Ream, W. (2004). DNA and protein recovery from washed stone tools*. Archaeometry, 46(4), pp.663-672. Taylor, R. (1995). Radiocarbon dating: the continuing revolution. Evolutionary Anthropology: Issues, News, and Reviews, 4(5), pp.169-181. Treangen, T. and Salzberg, S. (2011). Repetitive DNA and next-generation sequencing: computational challenges and solutions. Nature Reviews Genetics, 13(1), pp.36--46. Veeramah, K. and Hammer, M. (2014). The impact of whole-genome sequencing on the reconstruction of human population history. Nature Reviews Genetics, 15(3), pp.149-162. Watson, J., Crick, F. (1953). Molecular structure of nucleic acids. Nature, 171(4356), pp.737-738.